"There's a bewitching urgency to the narration that's impossible to resist. Theo is magnetic....The Goldfinch" is a pleasure to read." --Publishers Weekly"
"Dazzling....[A] glorious, Dickensian novel, a novel that pulls together all Ms. Tartt's remarkable storytelling talents into a rapturous, symphonic whole and reminds the reader of the immersive, stay-up-all-night pleasures of reading." 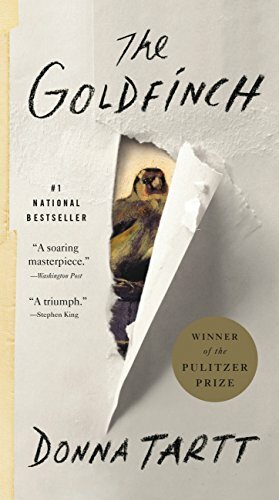 "Michiko Kakutani, "New York Times"""
""The Goldfinch" is a rarity that comes along perhaps half a dozen times per decade, a smartly written literary novel that connects with the heart as well as the mind....Donna Tartt has delivered an extraordinary work of fiction." "Stephen King, "The New York Times Book Review"""
"The Goldfinch is a book about art in all its forms, and right from the start we remember why we enjoy Donna Tartt so much: the humming plot and elegant prose; the living, breathing characters; the perfectly captured settings....Joy and sorrow exist in the same breath, and by the end The Goldfinch hangs in our stolen heart." "Vanity Fair""
"A long-awaited, elegant meditation on love, memory, and the haunting power of art....Eloquent and assured, with memorable characters....A standout-and well-worth the wait." "Kirkus Reviews (starred review)""
"It's a classic...If you haven't read it, read it. If you have, read it again." "Andy Cohen, "Today Show"""
"A soaring masterpiece." "Ron Charles, Washington Post ""
"Where to begin? Simply put, I'm indescribably jealous of any reader picking up this masterpiece for the first time. And once they do, they will long remember the heartrending character of Theo Decker and his unthinkable journey.""" "Sarah Jessica Parker for "Goop"""